HELLO and Thank You for visiting our current Listing of our latest Classic Car Restoration of a Jeep J10 Pickup by The Motor Masters!!! 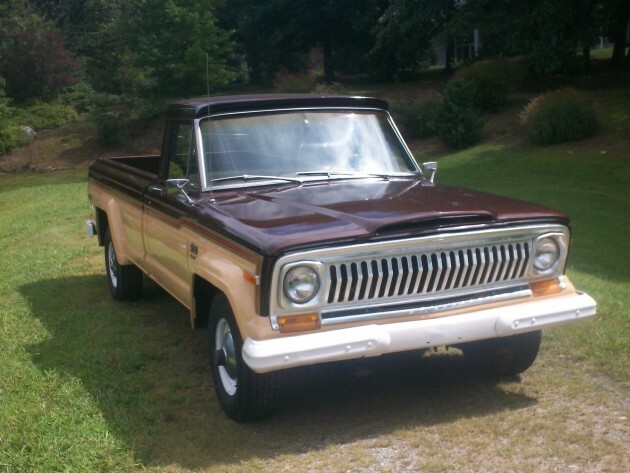 This is a CLASSIC 1978 Jeep J10 Pickup Truck. We purchased this Survivor locally here in Hendersonville and it has been a ONE OWNER NC JEEP ITS ENTIRE LIFE!!!!! We actually have the Factory Sticker, Books, and ORIGINAL TITLE that was dated 10/19/1977!!!! This is a Beautiful Survivor and was in extremely good shape prior to being restored. The Jeep has 107,442 ORIGINAL MILES and has been Beautifully Restored back to life! KEY COMPONENTS OF THE JEEP J10: Engine is a 258 Straight Six and has 3 Speed Transmission, 4WD, Power Steering, Factory Radio, Long Wheel Base, Factory Stainless Steel Wheel Covers, and Factory Outside Mirrors. The Bed is in PERFECT CONDITION!! NO Dents in the Walls or Floor. Headliner and Sun Visors are Factory and in EXTREMELY GOOD SHAPE. NO RUST ANYWHERE!!!!!! Also, pics of the Undercarriage are shown here. NEW ITEMS: BRAND NEW TWO-TONE PAINT JOB!!!! Other new items include NEW CAM, Lifters, Timing Gears, Timing Chain, Water Pump, Thermostat, Hoses, Heads, Tires, Stripes, Radiator, Carburetor, Fuel Pump & Filter, Spark Plugs & Wires, Distributor Cap & Button, Front Rotors & Pads, Master Cylinder, Rear Brakes, Shoes, Wheel Cylinders, Drums, Clutch, Pressure Plate, Release Bearing, Resurfaced Fly Wheel, and Battery. BUY WITH CONFIDENCE!!! WE HAVE A 100% EBAY POSITIVE FEEDBACK RATING FROM ALL OF OUR CUSTOMERS!! !